Light Noise from Gal Nissim on Vimeo. Noise is all around us, filling our ears with static sounds whether we want to hear them or not. White noise exists as the soundtrack of life. It is the background beat that flows together from varying sources – wind, cars, people, animals, bike chains, walk signals, mouth breathers, everything, everywhere, every moment. Light Noise explores the personalities that live within the noise that can be neither shut off nor muffled, yet often disappear into the background. It offers the engaged spectator the opportunity to exercise selective hearing and choose the lesser of multiple audible evils as the background soundtrack to their experience. You may not be able to shut it off, but you can switch on or off the Light Noise of your choosing. Each personality pulsates into view through a combination of projection mapping (MadMapper), visual programming (Max MSP), physical computing (Arduino), filming & editing (Adobe). The full Max Patch can be accessed here. 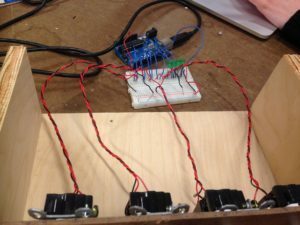 Below is the Arduino sketch used for this project. Light Noise began with brainstorming. A LOT of brainstorming. 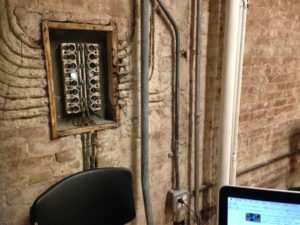 And then we saw it, shimmering in the dark corner of the 4th floor of 721 Broadway, an abandoned, decaying circuit box. Wondering what it could have possibly looked like in its heyday, we scoured the internet for old images of the building and found no clues. It was up to us to bring its story to life. 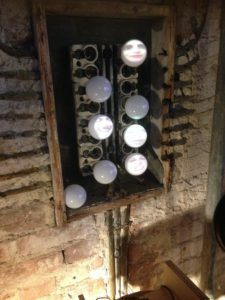 Our initial inspiration for the character of this electronic wasteland, was to fill it up with different faces and talking, one-per-slot. The voices would then lure in an audience by calling out “Psst, hey you!” or “Come over here,” phrases to that effect. Once an ultrasonic or infrared sensor would detect close proximity, the faces/voices would then dish out rude, teasing laughter as to push the spectator(s) away. 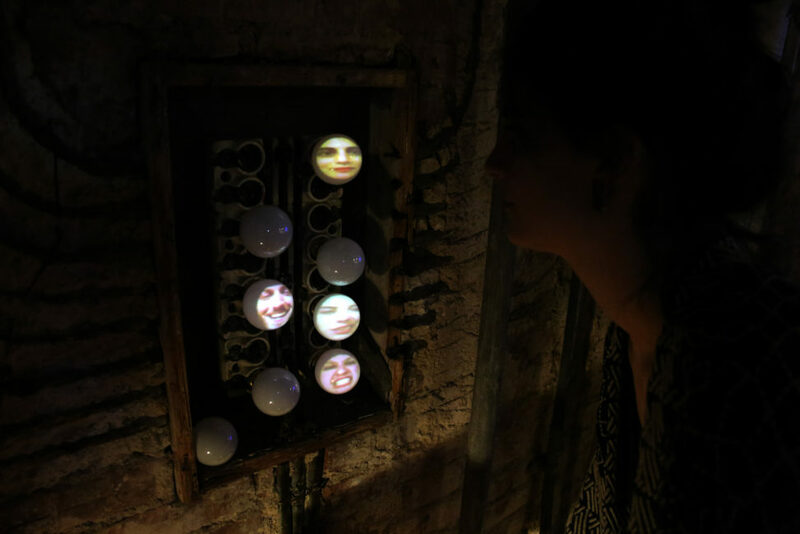 The sensors would be programmed to detect distance when the spectators move away, and the voices would then apologize, beg for forgiveness and ask for the audience to return. We narrowed down our list of faces/voices to eight people. After shooting the footage, our content led us down a new path. We cast our personalities and recorded 8 individuals roaring different types of human noises including maniacal laughter, hissing, whistling and other luring phrases. We cut each clip into the individual noises and sounds, giving each face a repertoire of sound options. We initially planned on projecting directly into the sockets onto white fabric, but we were not getting the best visual results. So we continued to brainstorm. It was hard not to stare at the Chernobyl-like structure resting on the back wall of the classroom. 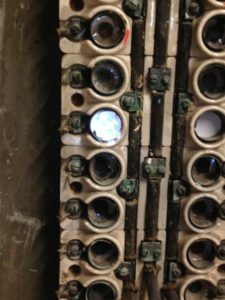 Upon closer inspection, the sockets were actually quite hospitable to current light bulbs. With some opaque bulbs in hand, we tested out the projection which proved to capture exactly the visual essence that we were aiming for. We sifted through the content of the different faces and sounds and our story began to take shape. Wanting to provide an experience that would capture and engage the audience, we moved away from the lure-laughter-beg forgiveness scenario and instead put the experience directly into their hands. And with this plan, we decided to build switches. 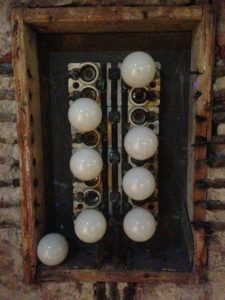 We initially wanted each lightbulb to be controlled by its own switch, however, we only had access to four switches. This informed the story and the experience. With white noise ever-bleeding into the background, one switch could turn off a sound and face, but turn on another, a never ending parade of noise both visual and audible. 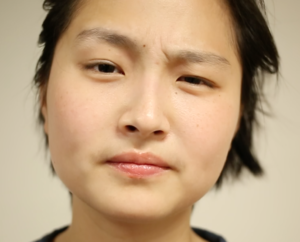 We then selected the sound that we wanted to use, each face expressing something different. We pulled these clips into After Effects to stabilize, edit and mask the images to fit the round surface of the bulbs. 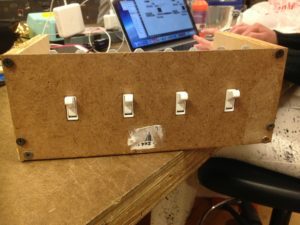 Using four over-the-counter light switches (thank you, K-Mart), we fabricated a box and rigged up a prototype. 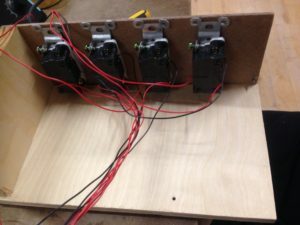 The prototype allowed us to check that each switch was accurately wired and working properly. We encountered a period of time where it was working then it wasn’t. With some testing we discovered that we had an issue with a common wire and were able to trouble shoot to a solution. With the Arduino code featured above, we were ready to bring the video and electronics together. 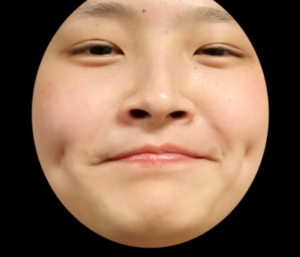 In order to get the Arduino and MadMapper projection software to interact with each other, we created a Max patch that pulled in the values from the Arduino and sent out an image through syphon which sent it out to MadMapper. Each switch was connected to two videos: one for the on position and then one for the off position. 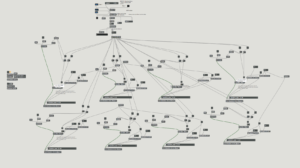 From here, we mapped out the 8 videos to fit the bulbs. With all of the patches, sketches, videos and wires talking to each other, Light Noise came to life. Special thanks to Gabe Barcio-Colombo & Todd Bryant.